The Aeroflight listing of Airshows Dates is split into four regions. Please choose the appropriate region of interest. Events not open to the public are not listed. Note: All dates are subject to change – check the official website before travelling. ‘?’ indicates event not yet confirmed. 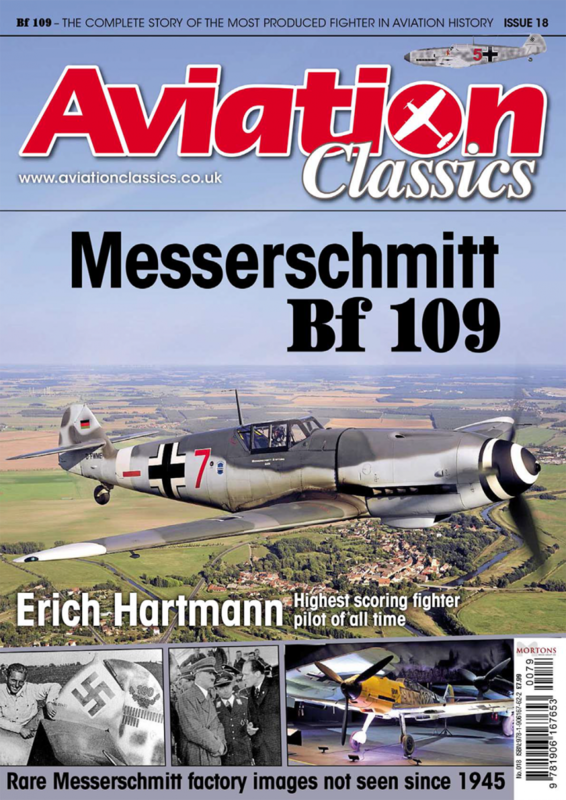 An all-time global listing of air shows is also available. Her Majesty’s Coastguard or, more commonly, H.M. Coastguard, is a division of the Maritime and Coastguard Agency (MCA), an executive agency of the Department for Transport (DfT). It’s main duties are coastal surveillance and pollution patrol. Aircraft are supplied and operated by civilian contractors. The Coast Guard was first established in 1822, primarily as an anti-smuggling force. It also had the secondary duties of safeguarding shipwrecks and life saving. The growing influence of the Royal Navy within the service resulted in the Coast Guard being placed under the control of the Admiralty in October 1856. Thereafter, the service also performed a formal role as a naval reserve force. By the early 1900s the anti-smuggling role had greatly diminished and the Admiralty was proposing to drastically scale-down the Coast Guard. This was opposed by the public, the Board of Customs and the Board of Trade, who championed the need for life saving and revenue protection. After a major inquiry, in 1923 the service was placed under the Board of Trade and specifically tasked with marine safety and life saving. This was confirmed by the Coastguard Act of 1925, which formally defined it’s roles and powers. This act also introduced the ‘Coastguard’ title as one word instead of two words. After using military helicopters for urgent marine rescues since the 1940s, in 1983 the first dedicated Coastguard helicopters were obtained from a private contractor. These helicopters operated off the coast of Scotland, filling the gap where the normal military Search and Rescue (SAR) service seen in the rest of the UK was not available. This service became known as the UK Gap SAR service. Fixed-wing aircraft were also contracted for pollution control work. In 1994 the Coastguard service became a Government Agency and in 1998 the Marine Safety Agency was combined with the Coastguard Agency to form the Maritime and Coastguard Agency. The success of the Scottish operations lead to similar contractor-operated SAR services at two locations on the south coast of England. 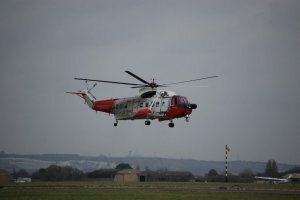 After awarding a new SAR helicopter contract to CHC Scotia on 13 December 2005, the Coastguard took delivery of four new Sikorsky S-92 and three new AgustaWestland AW139 helicopters to replace the ageing Sikorsky S-61Ns then in service at the four contractor-operated SAR bases. The five year contract ran from 1 July 2007 until 2012. Plans were announced in May 2006 for the merger of UK military and civil SAR helicopter provision from 2012, under a single civilian contractor. This target date was later moved to 2015. In 2012 Bristow Helicopters won the UK Gap SAR contract and took over operations from CHC in 2013. In March 2013 Bristow also won the new UK-wide SAR contract, committing to operate two helicopters each from 10 bases around the British Isles from 2015 onwards. The bases were to be operational 24 hours a day. Seven of these bases were new to contractor SAR operations and required significant infrastructure investment before operational flying could commence. Bristows ordered 11 Sikorsky S-92s and 11 AgustaWestland AW189s to provide this service. Unfortunately, the bad weather certification of the AW189 was delayed, and some AW139s and additional S-92s had to be drafted in, to provide temporary cover until full certification was received. Validation of the full-ice protection system on the AW189 was achieved in June 2016, allowing entry into service to commence. The complete SAR service is expected to be fully operational by mid 2017. 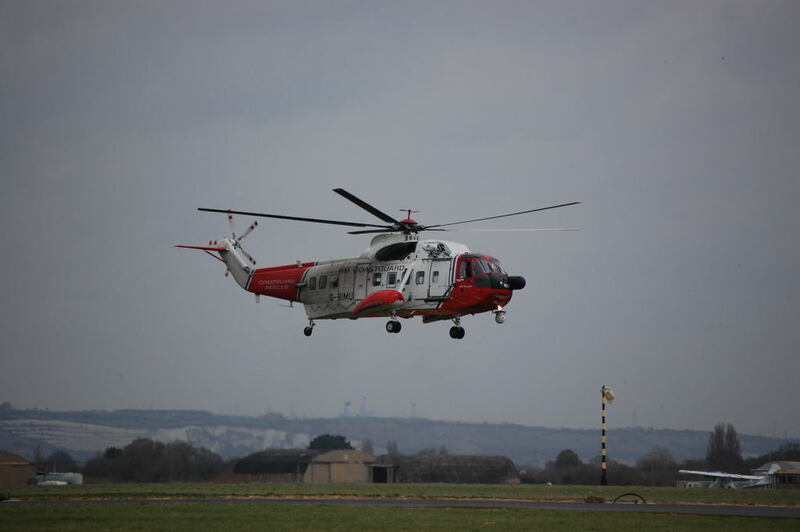 Bristow has commenced operations at all ten SAR locations required under the 2013 UK SAR contract. The full service will be available in mid-2017. Take delivery of 11 AgustaWestland AW189 helicopters by mid 2017, to replace the AW139s and S-92s used pending full AW189 certification. No national markings are carried. The service titles HM COASTGUARD or COASTGUARD RESCUE are displayed on the fuselage sides of aircraft and helicopters. Some anti-pollution spraying aircraft carry POLLUTION CONTROL titles. All aircraft and helicopters carry civil registrations. Recent helicopters have been assigned registrations in the G-HMCx sequence. Unit coding system not used. None – Manufacturers designation used. MCA Headquarters, Bay 3/25 Spring Place, 105 Commercial Road, Southampton, SO15 1EG. The aviation units of the MCA come under of the Directorate of Operations (DO), which is split into a number of Branches looking after Counter Pollution, Search and Rescue, Ship Inspection and Law Enforcement. Coastguard SAR helicopters are currently based at eleven different locations in the UK, but Portland will close in 2017. Fixed-wing pollution control aircraft are based either at the contractors home airfield, or at Inverness in Scotland. See current unit allocation table. As for current bases plus Southend (Essex) and Manston (Kent). Humberside 2 Sikorsky S-92 Humberside Airport, North Lincs. The first Lee-on-Solent based Coastguard Helicopter became operational on 15th May 1988. The Helicopter’s normal operating area stretched from Beachy Head in East Sussex to St Albans’s head in Dorset, including Poole Harbour during the day. At night, this area was extended to include Start Point in Devon, a coastline of some 170 miles in length. This area extended to the mid-point of the English Channel. Occasionally the helicopter was tasked to incidents outside this area due to its FLIR capability. Since it was established in 1988 Lee-on-Solent has proved to be the busiest Maritime Search and Rescue helicopter unit in the United Kingdom. Under a unique agreement with the Hampshire Ambulance Service NHS Trust, the latter provides an paramedic crew for medical emergencies at sea. Hampshire Ambulance despatches a paramedic ambulance from their nearby Gosport base and the ambulance crew board the Coastguard helicopter at Lee-on-Solent, together with their paramedic kit and a portable radio which transmits on ambulance frequencies. The S-61Ns were operated by Bristow Helicopters Ltd under a contract that expired on 30 June 2007. They were replaced by two new AW139 machines supplied by CHC Helicopters. In March 2006 the MCA brought the Lee-on-Solent airfield site from Defence Estates, securing it’s future. On 1 December 2006 construction commenced of a new hangar to house Coastguard helicopters. It’s first occupants were the new AW139s. The Hampshire Police helicopter also operates from a location very close-by. Under the UK SAR contract awarded in 2013, Bristow Helicopters took over operation of the service from CHC in 2015. The AW139s were replaced by newer Bristow-owned examples. These AW139s are in turn due to be replaced by new AW189 machines in April 2017. One fixed-wing aircraft based in Kent, to patrol the Dover Straits on behalf of Dover Coastguard. Carries air-droppable life-rafts, marine radios, law-enforcement evidence-gathering equipment etc. The Islander was operated by Atlantic Aviation Ltd and retired in 2007, apparently without replacement.